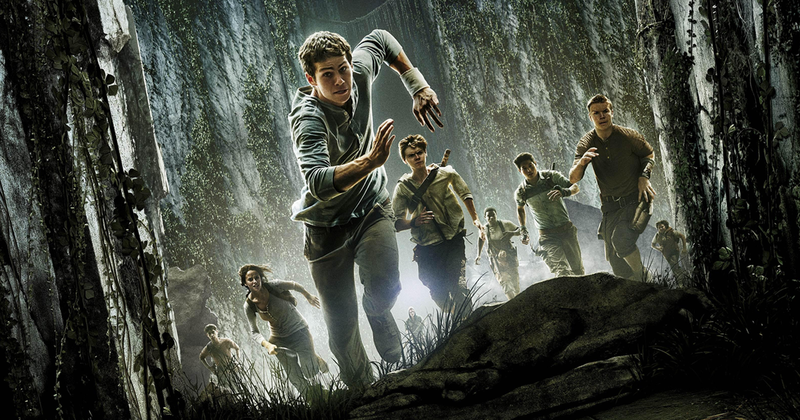 The Maze Runner is the latest installment in our culture's current obsession with young adult post-apocalyptic science fiction, and despite not being part of its target audience I had a splendid time with it. Don't get me wrong, it's no revolution in adapting YA fiction for the screen, but it has its fair share of memorable moments and is generally entertaining despite its clichés and contrivances. And all things considered, it should have been so much worse. It's The Hunger Games for boys, with no Jennifer Lawrence and no grown-ups to anchor the performances. But somehow it hops effortlessly along, and by not setting its sights too high it feels like it achieves exactly what it sets out for. In the interest of full disclosure I should probably say that I read the book first and liked it for what it was. Like the movie it inspired it was a fairly simple coming-of-age story set in a fairly unique dystopia—which I suppose amounts to "a unique cliché," but nonetheless. It worked thanks to its effective characterization and occasionally intriguing ideas. It didn't stray too far from the modern mold, but it filled it out nicely enough. The movie is much the same. It makes some changes—many of which improve on the book—but for the most part it feels like a safe and by the numbers adaptation. It's very much the same type of movie we're used to seeing at this point: a young person faces adversity which mirrors their internal struggle to decide what kind of person they want to be. 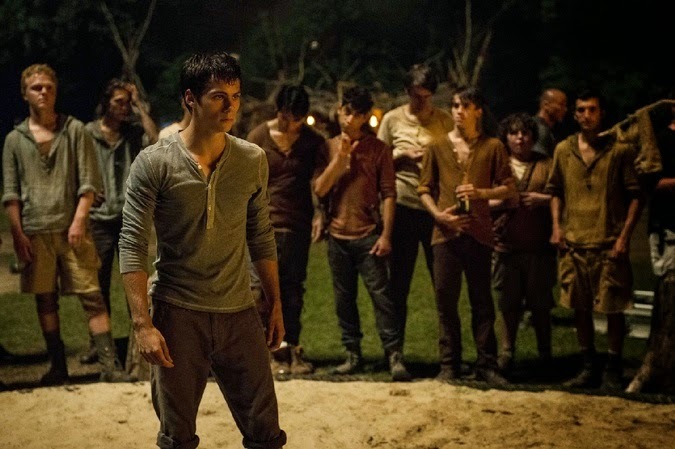 Thomas arrives in The Glade with no knowledge of who he is, and he eventually joins the Gladers' attempt to solve the mysterious Maze. Like its cousin The Lord of the Flies, The Maze Runner can also be read allegorically, although not on as grand a scale. The Maze is an analogy for Thomas's mind: he must navigate both successfully to be victorious. The film is both a literal presentation and an allegorical representation of a boy growing up. Thomas's literal struggle to find himself parallels an identical figurative one, so for example facing the monstrous "Grievers" represents him emotionally confronting grief. It's not remarkably deep or complex, but the two levels of the conflict are presented well enough to be enjoyable. One of most compelling aspects of The Maze Runner is the way it attempts to deal with the problematic nature of the "chosen savior" trope in YA. Stories with one character who is seemingly destined to change the world are popular because viewers can identify with the savior, but this frequently develops with an overbearing sense of unconscious, conceited narcissism. If you step outside the protagonist, their presentation changes fundamentally. They can save the world because they're different, but from that outside that changes to "They can save the world because they're better than the rest of us." Occasionally this trope is used effectively to develop a social commentary (e.g. The Hunger Games), but more often than not it lies beneath the surface, leaving the story penetrated with an appealing but dangerous egoism (e.g. Divergent). Where these troubled narratives stem from a distinctly Western ideology (i.e. justifying capitalist oppression because the 1% is better than the rest of us), The Maze Runner takes a step toward a more communitarian ethic. While Thomas is identified as a catalyst for the changes which uproot the society of The Glade, he can't function without his fellow comrades. He needs his community in order to survive, making his central nature more a simple necessity of the narrative structure than a problematic result of the story's ideological politics. There's a long laundry list of ways the film changed the book, but most of them involve relatively minor details, and overall the characters are left more or less intact. In general the cuts were chosen well and streamline the storytelling to fit the necessarily different structure of film. Many of the alterations actually improve the story: for instance, the removal of Thomas's internal monologue eliminates the feeling that he's withholding important information from his friends, something which bothered me in the novel (nobody likes a liar). Some changes don't work so well—the crucial community meeting which highlighted the central theme of working together is drastically cut and loses this key aspect—but these are decidedly in the minority. 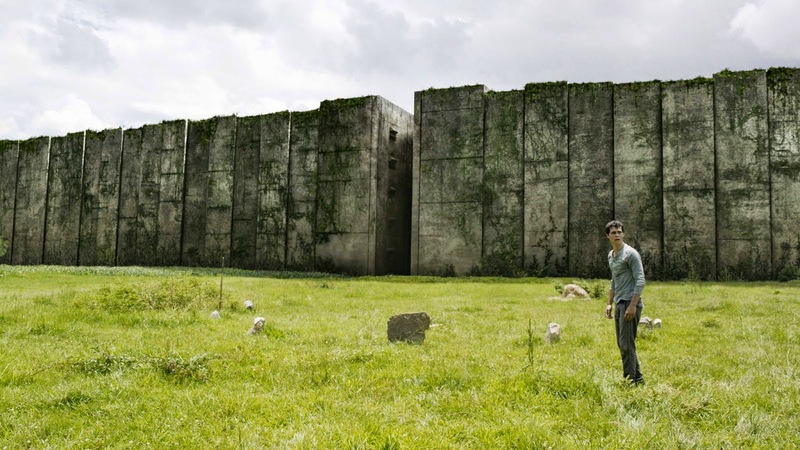 In terms of finding its raison d'être in the cinematic world, The Maze Runner features some surprisingly memorable visuals and a selection of creative sound design. The Maze is impressively imposing, and more than one of the sequences inside it showcase what I can only imagine are fairly intricate sets (dressed up with computer animation, of course). Occasionally sequences feel slightly underlit, but otherwise everything looks very nice. The Grievers also make some really great noises which give them a more significant presence in the film. It might not push any boundaries, but The Maze Runner is a relatively entertaining installment in the realm of YA adaptation. It provides enough material for cerebral idiots like me to think about while offering an enjoyable ride for viewers more concerned with entertainment. It might not be winning any races, but it successfully runs the maze it sets for itself, and maybe that's all we ought to expect from movies like this.